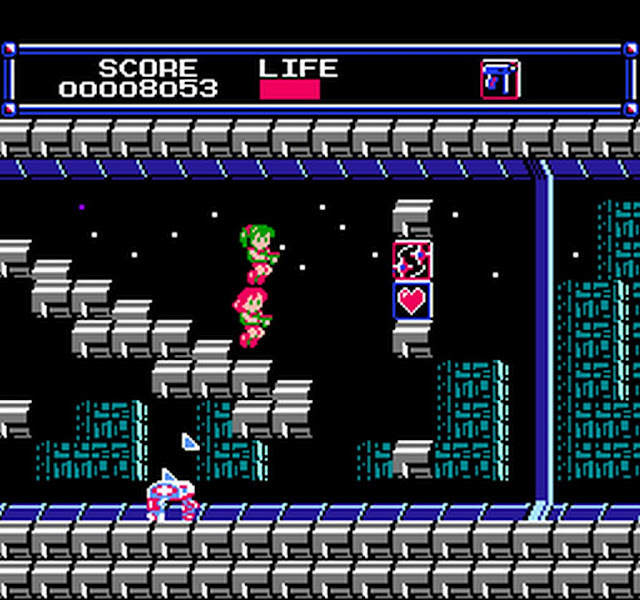 Prepare for blasting action as Supper via the Romhacking website has released the full enhancement hack for the Japanese only NES game ' Layla The Iris Missions '. In this action packed platformer, you play as Lyla on an Iris mission to defeat Chinelkov Manitokha and his army of mutant Chimairan. Throughout the game you'll be blasting enemies, fighting big bosses, collecting items and trying not to be crushed by the 30ton weights to save the galaxy! If you've been wanting to play this game but haven't been able to do so for some reason, then now is the time to load it up and have a blast. This massive enhancement hack features all new levels, altered graphics, an original and much expanded soundtrack, lots of tweaks to the game mechanics, puzzles, robot mascots and is also completely playable in English. So find that ROM file, patch it, and load it up on real hardware or your favourite Emulator! You will need a patching program such as beat or Floating IPS to add the hack/patch to the main Layla (J) [!] (GoodNES 3.14) Rom, which isn't available here.